Biochemical Actions of Hormones, Volume VI is a 10-chapter text that summarizes the regulation of protein kinases and phosphoprotein phosphatases and the relationship of the endocrines to cancer. 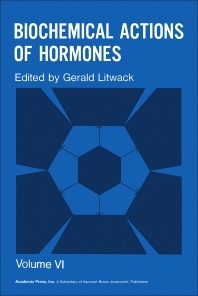 This volume describes first the precise structures of steroid hormones and carcinogens. The subsequent chapters cover the hormonal regulation of chemical carcinogenesis; the importance of steroid hormones as growth factors for mammary tumors; the effects of steroid hormones in the central nervous system; and the properties of the purified estrogen receptor. A chapter highlights the biochemical actions of neurohypophysial hormones and neurophysin. Another chapter presents the biochemistry and physiology of cytokinin, a plant hormone. The final chapter exemplifies the multihormonal systems by control of the α2u-globulin produced in the liver. This book will be of great value to endocrinologists. 5. How Important Are Steroids in Regulating the Growth of Mammary Tumors?